There he sits, waiting you out. You've said, "You can't get down until..." and he's waiting to see if you really mean it. Some would call him obstinate, even stubborn -- and that may be true. I wrote about Your Compliant Child last week and very few people commented. And it did dawn on me that there are those who don't have a complaint child...and those who find every day a bit of a challenge right now. I tell a story in I'm Outnumbered about this very battle of wills; this incident was a real eye-opener for me. My son's preschool had a drive-through pickup; they shepherded the little ones into a waiting area and popped them efficiently into the car. One day I stopped to pick up my son and the teacher approached the car alone. She smiled and asked, "Can you park and come in for just a minute?" I parked and walked into the classroom, fearing the worst. The sweet teacher proceeded to explain to me that it was Circle Time and my son was called repeatedly to leave the play area. 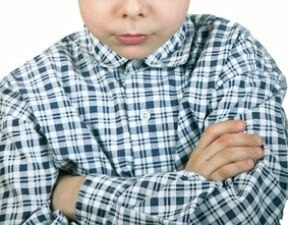 When the teacher walked over and reminded him (using the usual preschool jargon) that "we choose to obey," he looked up and replied calmly, "I choose to disobey." A knot formed in my throat and, in my mind's eye, I saw his future; I thought he was bound for the life of a criminal. I choose to disobey? Maybe it's just me, but at such times I can never stop the mom tears from pooling in my eyes. We talked through the problem and discussed how to address this at home, and that sweet preschool teacher prayed with me. As I turned to go, she caught me by the arm and uttered words that were a salve to my soul. "Being stubborn isn't always a bad thing, you know. We just need to channel that. Someday he'll need to be stubborn for the right things." We want our children to stand strong for the right things; we hope to foster a firmness and determination for what's right as they grow. And what about me? When I list what I'm stubborn for and about...am I obstinate about what really matters? Or do I just sit, waiting it out -- for what I really want? Looking forward to Mother's Day? Enter my giveaway and honor a "boy mom" you know -- read all about it here! You hit the nail on the head with stubbornness needs to be channeled and may not be all bad. I prayed and prayed that my strong willed child would have good, godly friends - and she did - and I knew once she made her mind up - for example, I won't do drugs and I can say no - she would be ok. yes stand up for the right things like the underdog too. It just takes loads of time and energy and never never giving up. Stubborn for the right things ... I needed to hear that. I have a mix of compliant and willful sons: a couple of leaders and a few followers. Sometimes it helps to know that you aren't the only one who gets pulled aside by teachers for those sort of discussions. I have one mostly compliant child and the little one its still to early to tell. Sorry about not posting a comment sooner but since I started reading blogs in google reader I don't comment very much any more. Please know that I am reading and do appreciate your words and wisdom. :) Glad I could help! She's not a bad child by any means, but she's definitely not compliant! I'm sure if we had another it would be a compliant child though. That's how it worked for my parents lol. I love the story of your son. She'll be starting school soon and I know we'll be getting a lot of these moments! Oh boy, I have been there...now my sixteen year old son does this still. It is tiring and hurtful, but as long as I remember that if I don't stay firm, what would he learn? My oldest was such a handful from 14 months to 3 years. I thought something was really wrong with her. But God kept whispering to my heart that she needed the traits He had given her, but we just needed to work on training them in the way that they would be most productive and useful. What a sweet and wise teacher. Would this happen to be your 2nd son? 'Cause it sounds very familiar!!! Ah, yes. We have the rule follower who lives to please, and we have the other one who pees on the floor and then dances in it just because she can (Don't be weirded out she is only 2!). It's funny. I worry constantly about the rule follower, but the little, sassy dancer, I don't worry about as much because as little as she is I know she can "hold her own". Good question. Am I stubborn about things that matter. Thanks for this post. I can't say that I have a compliant child, and at night, I pray that each of my strong-willed children will be strong-willed in their convictions someday. I needed to hear today that I'm not alone. Your son is definitely thinking outside of the box. He is destined to be a leader!! I see a "to be continued" that isn't here...but one day, you'll be blogging about his stubborness over the right things in life. You just wait.